There is no way to prepare yourself for India. Not by reading books or watching Monsoon Wedding or scouring the latest edition of Lonely Planet. Nothing can prepare you for the heat. The crush of bodies. The smells (both good and bad). 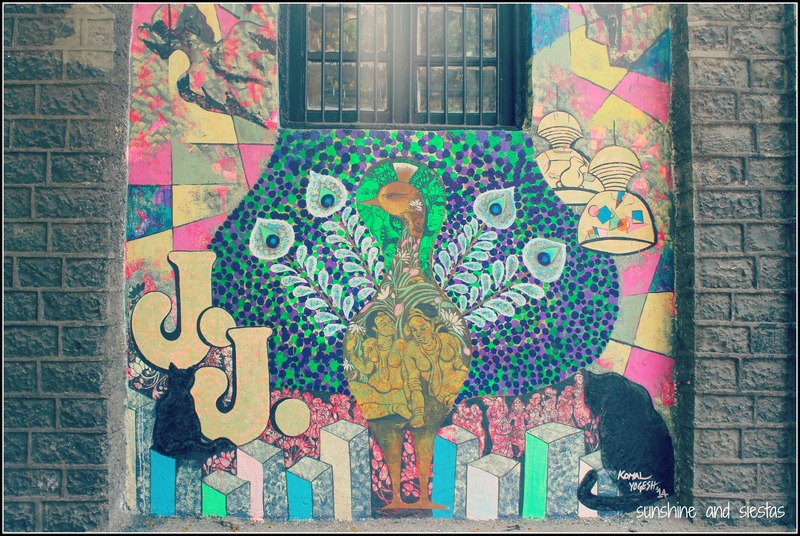 The menagerie of animals eating trash on the street. The traffic. True to every single thing I heard about it, India was an assault on the senses. I woke up groggy every morning from listening to the cacophony of tuk tuk horns that had my ears ringing all night. Every meal seemed to taste better than the last. I was humbled by the simplistic nature of the barefoot kids who were happy in their ambivalence. I have a newfound love for Bollywood tunes, marigolds and milky chai tea. India got under my skin in a way that only Spain has. But India comes with a learning curve as steep as they come. After more than 24 hours of travel from Seville to Delhi, and countless more hours awake, Hayley and I were burped out into a muggy, overcrowded city, which was beyond foreign. And our room wasn’t ready either, so we gingerly ventured into the mess of streets in the Kailash Colony area of South Delhi, only to get lost, whine at one another and take a tuk tuk to the closest thing on our map, the Lotus Temple. 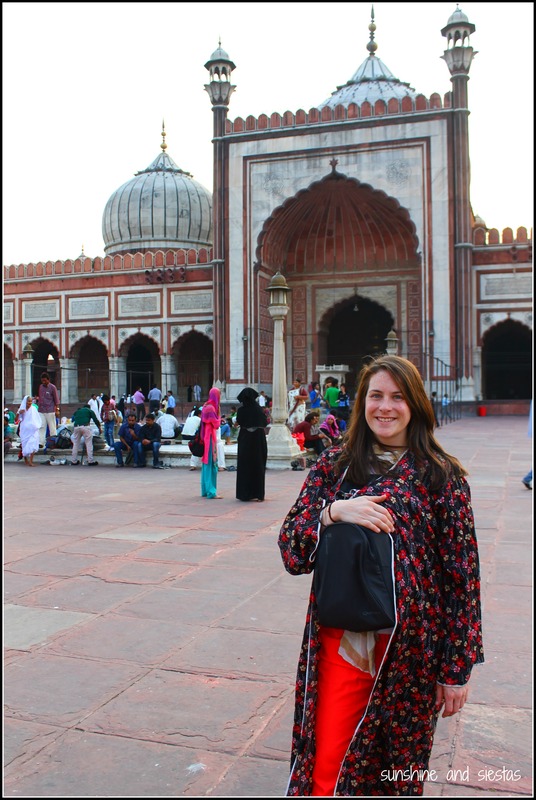 After a nap and shower (and a fresh change of clothes), we wanted to see the Jawa Masjid temple in Old Delhi, in the shadow of the overpowering Red Fort. We took the metro to the wrong stop, couldn’t fend off the dozen tuk tuk and rickshaw drivers who tried to pick us up. We walked through a part of town where it seemed that tourists were anywhere but, finally using the call to prayer to direct us to the beet-colored Muslim mosque. We had a disastrous first meal in India at the celebrated Karim’s (WHY would we order mutton? We must have been that jet lagged…), and then after having women ask to take pictures with us Hayley the streets and dodging every sort of traffic imaginable, including pushcarts, cows and people crawling, we treated ourselves to frozen yoghurt and a sleep not punctuated by anything else but blackness. 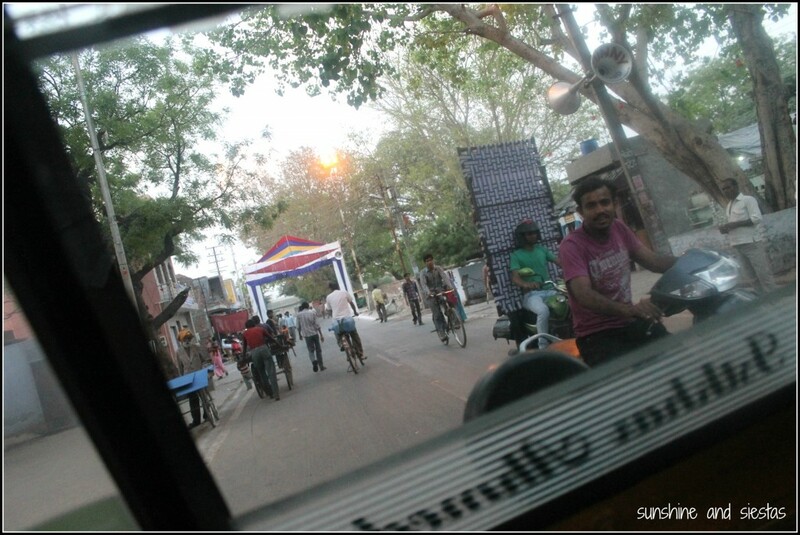 As we crawled into the tuk tuk the next morning, I was not excited. 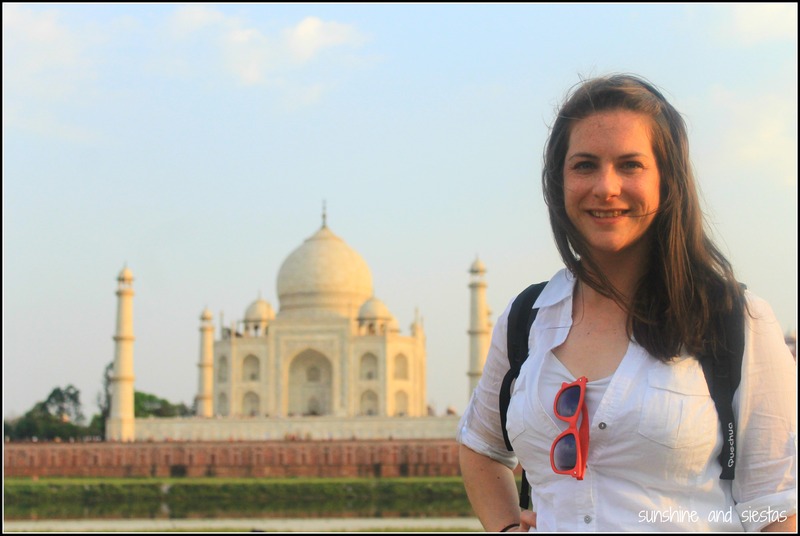 In fact, I was ready enough to leave India without seeing the Taj or eating aloo gobi or giving it a second chance. I kept my feelings silent to Hayley for the entire day, realizing that this was her dream, too, and that the only way to make up for the previous day was by opening my mind and heart back up to incredible India. We soon found that adapting to locals’s customs was the only surefire thing we could do to not stick out as a gora as much as we already did. We watched, and we repeated. India is full of idiosyncracies, especially across regions. In such a large country, each part of the patchwork is just a little different from the rest. I maintain that just walking across the street, one can see everything and nothing, an array of headgear, mustaches, body types, sari styles, skin tones and accents. It’s not called a sub-continent for nothing! The head bobble: Ah, the Indian head wiggle. While in Delhi, Hayley and I didn’t see much of the ever-famous head movement that is used to communicate both yes and maybe. But when we got to our hotel in Jaipur, run by a family from Kerala, we were taken aback but the range of motion used when communicating a simple yes or no. It took us a few days to perfect, but on our last day, we had a conversation with a five-year-old girl from Pune, in English, who mostly answered by wiggling her head. Learn it and love it. Clothing: Other travelers suggested buying a salwar kameez, the long tunic worn over loose-fitting bloomers, and not bringing sandals, but sturdy sneakers. I figured we’d buy something in India, but those salwar blouses looked far too hot for the 90° and humidity. We did stick to modest clothing, but in urban centers like Delhi and Mumbai, we saw younger women sporting everything from dresses to leggings to saris. Dress modestly at all times, but wear what’s comfortable and breathable. Just like the Camino, we brought clothes that would dry easily and a bar of laundry soap. I caved and bought sandals, as well – my feet couldn’t take it! Men holding hands: In Spain, many female teenagers hold hands with one another. In India, it was mostly grown men. We observed, and we did, but only for fun and because we love each another. Bartering: It’s common knowledge that there’s an added gora tax in India – if you’re a Westerner, you’ll have a more inflated price than an Indian. This was evident in none other than the Taj Mahal, where we paid ten times as much to see the world’s most beautiful building (and elbow people out of our pictures). 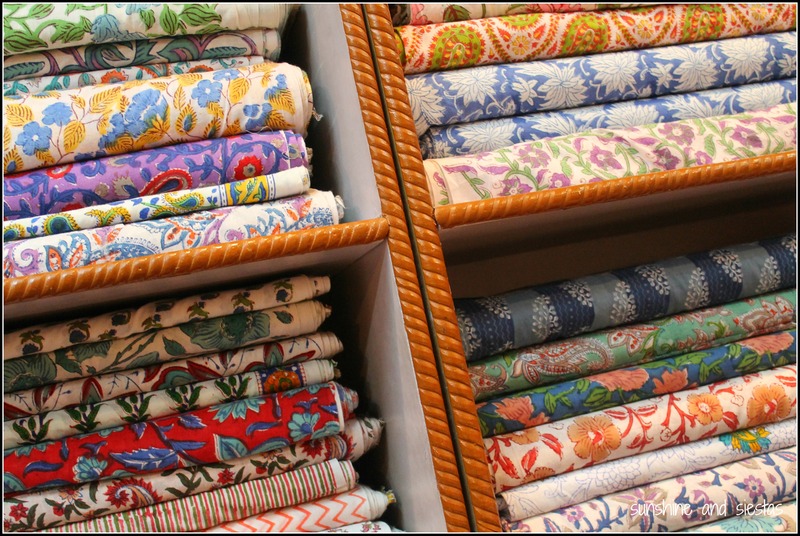 Bartering is quite common in India, for everything from taxis to clothing. We couldn’t really watch locals haggle, but we’d watch them walk away, only to have the salesman follow and seemingly offer a better bargain. I personally like Hayley’s take on bartering: only offering the price she was willing to pay, and repeating that figure over and over! 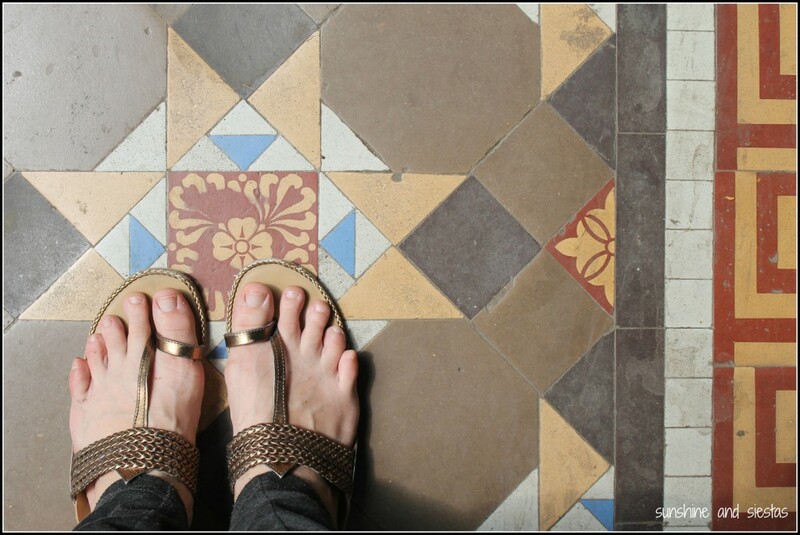 Touching Feet: One morning, we found ourselves at the Agra train depot on our way to Jaipur. Our train had not only moved tracks, but had also been delayed several hours. As we staved off sleep and tried to take in everything around us, a crawling man approached us and touched our feet as we watched, bewildered. As it turns out, touching feet is a sign of respect called pranama, and it is usually performed by children to elders, or by women to their husbands. After leaving us (and asking for money), he did the same to other travelers, who shooed him away. No getting around it – there are 1.2 billion people or so in India, and they’re mostly crammed into its major cities. The sheer amount of bodies and cars and rickshaws and random cows on the street are enough to make you considering a private driver (we did in Agra and Jaipur). Crossing the street: As Todd from the hilarious show Outsourced quips, crossing the street in India is like a real-life game of Frogger with people. When we’d timidly set out to get from one side of the road to another, one of us would pull the other back, until we decided to stick with big packs of locals and cross when they crossed, or just start walking and hope we didn’t get hit. After all, the tuk tuks always seem to find a place to squeeze into! Tuk tuks: Our favorite way of getting around was by tuk tuk, which looked like glorified tricycles with a backseat and a roof. Not only is this option economical, but also hilariously scary when you’re zipping through traffic. We saw entire families cram into one backseat, so we treated our trekking bags like small kids and stuffed them between us so as to evade possible bag snatchers. We also learned early on to ask the price of your trip and reach an agreement before getting in (head wiggles works), and please keep your limbs inside the moving vehicle. May not be Disneyland, but the same rules apply. Trains and Undergrounds: We hadn’t yet been assigned seats (India Rail’s website is the most inefficient and confusing mess of words ever), so we inquired at the ticketing office. The elderly woman scribbled something on our printout and directed our gaze to the electronic board, which announced comings and goings. It had been easy to find out seats the day before en route to Agra, as train cars were clearly labeled, and the train stopped completely on the tracks for five minutes. First class seats are assigned, whereas lower classes have simple wooden benches and people cram into the compartments. When our delayed train finally showed up, patrons were jumping onto the platform from a still-moving train. There were close to 80 cars, and not one was labeled as first class. A man snatched the ticket out of Hayley’s hand and showed us onto a sleeper car. We tried to protest as we were shown a berth where an elderly couple sat drinking chai. The morning before, we’d shared a table with a wonderful older couple who had shared stories as we had a complimentary breakfast. Snackless and exhausted from an early wake-up call and over waiting, we fell asleep right away, and when we woke up, the couple was gone. 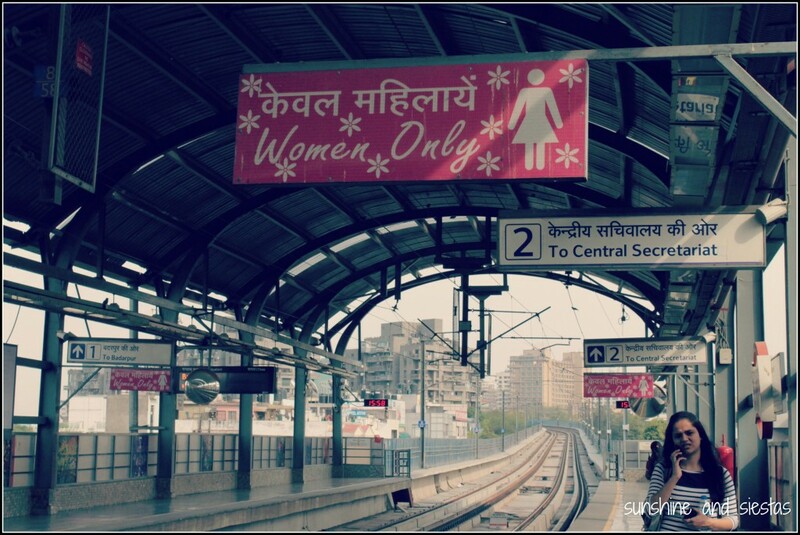 Delhi has an underground system that was a life and penny saver when we visit the capital city. While the system itself is not complicated, we found out the hard way that you have to pay in exact change to get a token, which you then place into a machine. This token must be kept until you exit the system. We were delighted to find that every train has a specially designated “Women’s Only” car, meant to keep gropers at bay. 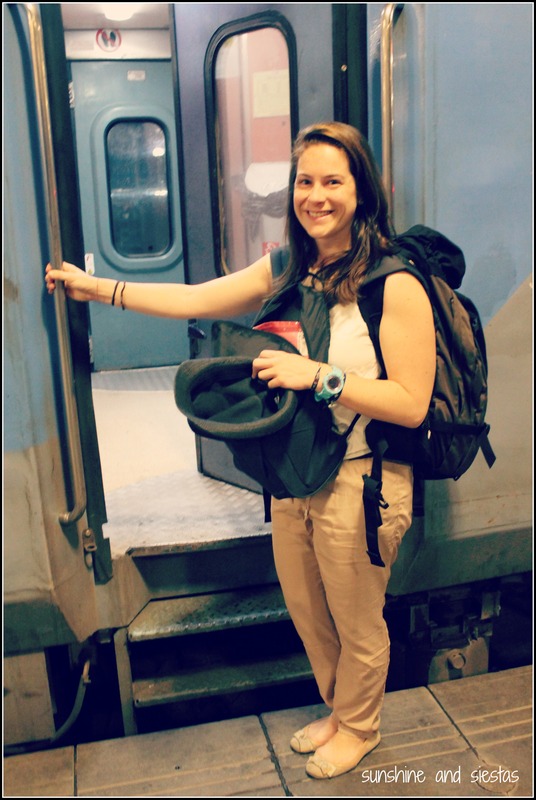 The cars were clean, roomy and air-conditioned, though we were in for a shock when we arrived to the hub at Central Secretariat, where we had to change platforms and run to the other end of the train for the women’s car. We did as the Indians do: pushed hard! There’s also hella security in the underground. Apart from having to actually pass your bags and body through scanners, there’s always a man with an AK-47 right at the entrance to the trains. I can honestly say I felt safe in India! Confession: the real reason Hayley and I wanted to go to India was for the food. My mouth watered for baby corn masala, naan and fresh coconut water from the moment we touched down in Mumbai. 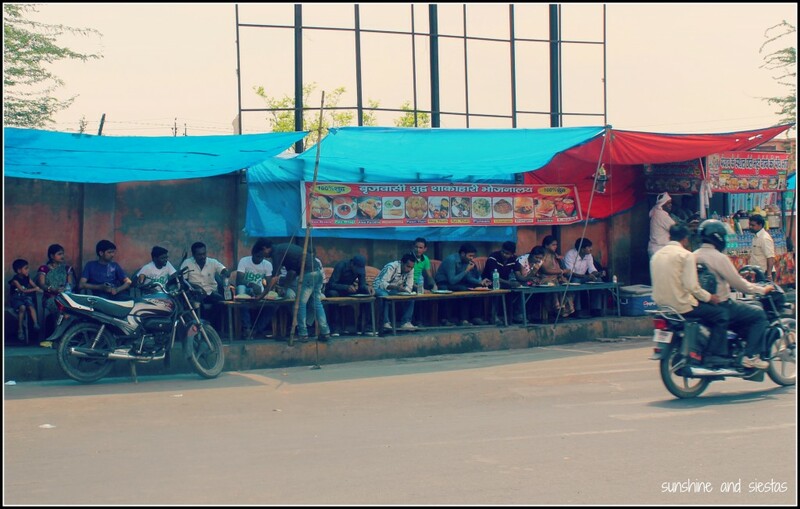 Thanks to my strong stomach, I had zero problems with food while in India. Indian meal times are similar to Spanish meal times, but a tad earlier – breakfast usually before 9, lunch around 1 and dinner at 8 or so. To everyone who told me not to eat street food, I both love and hate you – so much of it looked so enticing, from fresh coconut slices to fried churro-like candies. Meal time was one of our favorites – we could relax, plan the rest of our day and tuck into delicacy after delicacy. I have a new appreciation for vegetarian cuisine, for long meals and for using my hands and pushing pieces of bread as a utensil. Safely eating: “No, no, you eat this way.” The man in 32K next to me shook out the dried spices and sugar into his mouth, chewed it up a bit, and spit it in his napkins. “Very nice breath!” he said with a smile, and I followed up my Indian dinner on the plane following suit. I clearly know less about Indian food than I thought. After a disastrous first meal at Karim’s, we decided to give its second branch, near Humayan’s Tomb and the Hazrat, a try. Tucked into a small street in the Muslim Enclave, the place oozed Far East. The wait staff lead us to a table in the corner, under and air vent, and the power went out as soon as we ordered. 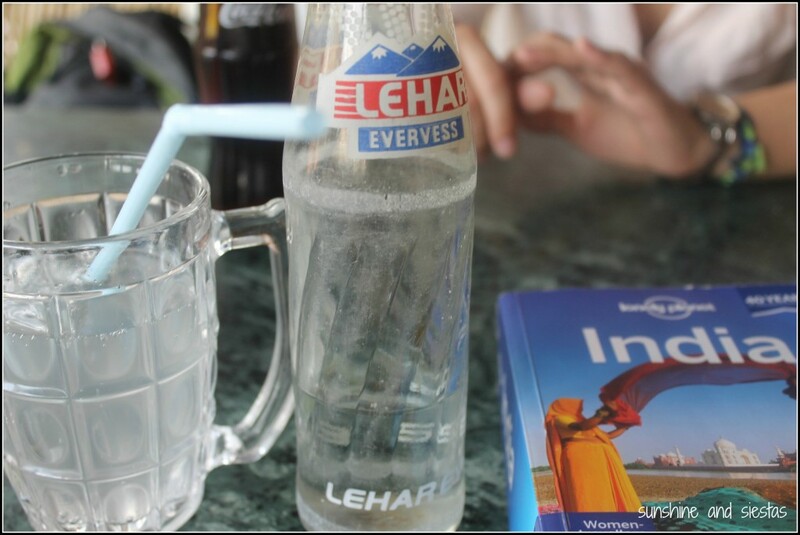 A British couple sat next to us, sharing our table and their stories of three months of non-stop travel around India. They explained things on the menu to us and warned us against eating anything that was able to reproduce. Paneer, a bean curd tofu, stuffed chapati and aloo gobi became our staples during the week, and we mixed them with different sorts of sauces and curries. We also tried to avoid uncooked food or anything fresh. I missed vegetables and yoghurt after a few days, as well as beer. Taxes on alcohol are exorbitant in India, so lay off the slosh if you want to spend your money elsewhere. I did order a “pitcher” of beer at Leopold’s that was easily three litres. Water bottles: India was just on the brink of the hot weather when we went in mid-April. Warned not to drink the water, we were sure to have a few bottles on hand for drinking and brushing our teeth, and were willing to shell out for untampered water bottles. If you see that the security ring on the water bottle has been broken, return immediately. Some restaurants or roadside booths will re-use bottles and fill them with unfiltered water. Be cautious with the fizzy lemon drink that’s a popular alternative to pop, as well. Ask the waiter to open the bottle in front of you. India didn’t leave my consciousness right away – I had a nasty virus or parasite or magical fat burner for a week after returning to Europe – and it still hasn’t, a month after we returned to Spain and drinkable water. My body heaved a sigh of relief as soon as we’d been bumped to business class for our long haul flight, as if I didn’t have to have my senses sharpened and my head on straight all the time (I missed you, beer). My boss was right when she said that India has all of the beauty in the world, but it is full of shadows. We were scammed and once put in a potentially dangerous situation. Women offered us their babies at corners. Heat, anxiety and lack of vegetables left us weak and then made us both quite sick. But I think that India is the sort of place that you have to plunge into, headfirst. 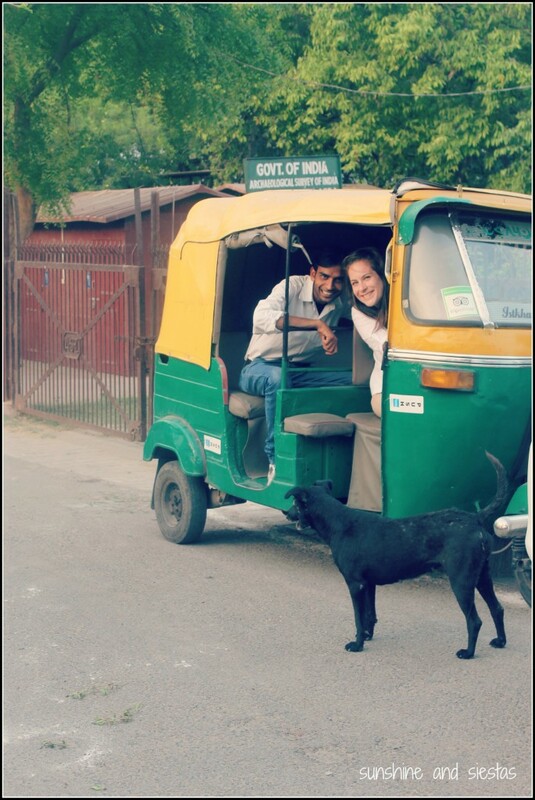 I sometimes envied the travelers who were seeing India on circuit trips between Delhi, Agra and Jaipur. They didn’t deal with train delays or scams, but then again, they didn’t have any sense of adventure when it came to figuring things out on their own and recovering from mistakes. Hayley and I discovered more than we had imagined during out eight days in India, evident with her quick stride as she crossed busy avenues and pressing our hands together in the Namasté greeting. India did as good a job embedded itself into my heart and my head as the parasite did in my rock-hard immune system. I just hope the memories of one last longer than the other! Have you ever felt like a fish out of water on your travels? Tell me about it! Wow, what an adventure! On the one hand, I’ve always dreamed of going to India, but the longer I spend in safe, clean Australia, the harder it is to imagine going there. This post has made me realize I’ve lost some of my adventurous spirit in the past year! India is still on my radar for the future, though. You are most welcome to India !! Thank you! We had a wonderful time and can’t wait to go back. Amazing how real life can drag you down, right? Cat, I love India for all the things you’ve mentioned. It’s both intimidating and endearing. I think you’ve captured it’s essence quite well. Thanks, Corinne! Took India a while to sink in after my trip, but agree that it’s overwhelming and hard to forget. Great post, Cat. Having married into an Indian family, I got a kick out of reading about your experience. I forwarded it to my wife because the Indian head bobble has been an ongoing inside joke…she says she never noticed it among her relatives until I had pointed it out. Also, I’m convinced the best way to avoid Delhi belly is to consume at least one Kingfisher beer per day while in India (the largest size). My Dad and I swear by it since we were the only ones to follow that routine during our last visit. And wouldn’t you know it, we were the only ones of our group to not get sick! I like your thinking! We had a tough time finding alcohol in Agra, though, as we were there on their election day without knowing. What does your wife make of the new prime minister? Wow, that sounds like a really intense trip (in both good and bad ways, I guess). Your descriptions make me both want to go right now and unsure about going. But I’ve wanted to travel to India for a long time, it looks amazing and colorful. And the food…yum! One of my aunts is Indian and she and her parents know how to cook the most incredible food. 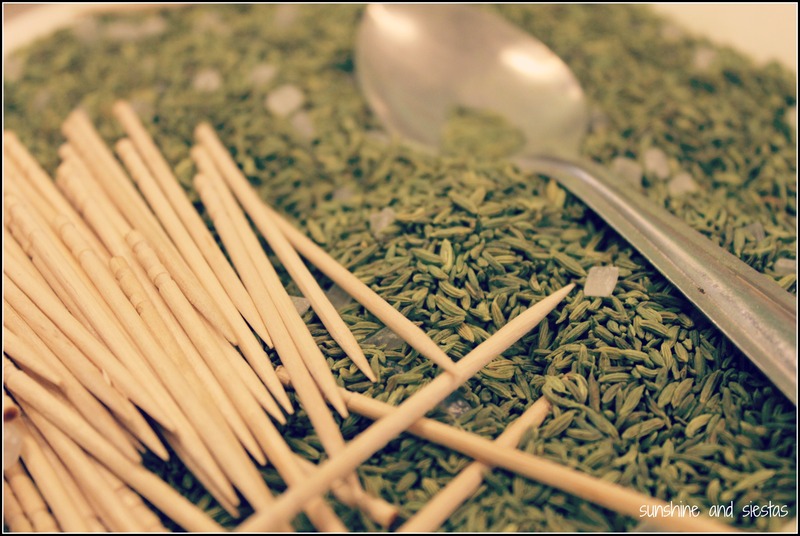 A question about those after-dinner spices – is it that anise/licorice flavored stuff? I think the after dinner spices must have been the anise stuff. IT was so weird and grainy in my mouth that I only tried it once or twice! And color me jealous – an Indian relative?! YUM. We haven’t been to India yet. Your in-depth chronicle of your adventures there make us want to. And not only because we’re vegetarians. But the food is a definite draw. You guys would be in heaven! 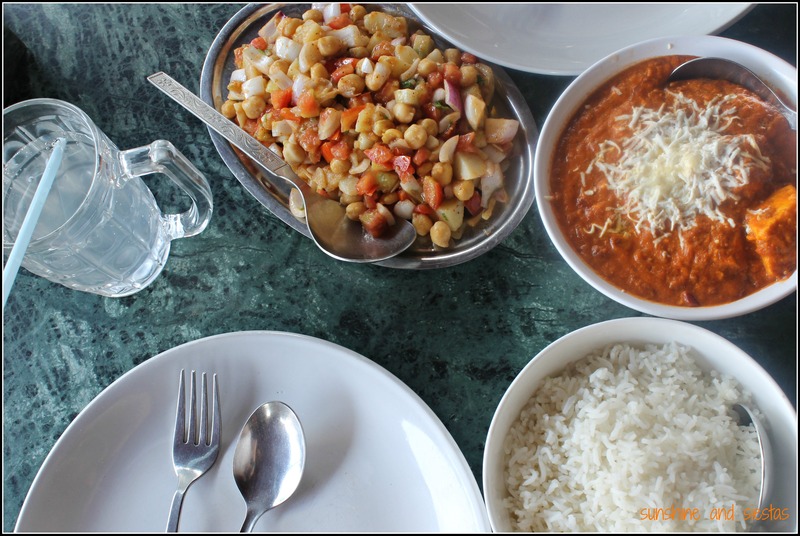 We mostly stuck to vegetarian food (with the exception of that mutton – yikes!). There was quite a bit of halal food, as well, especially in the more Muslim-heavy North. WOW you really captured the beautiful insanity, variety, and wonderful wildness that India must be all in one post. I’d love to go there one day but I think I’d have to do a l o t of research, planning, and mental preparation before going there—it sounds really intense and very different. Looking forward to hearing more about your time there in the weeks to come! Thanks, Trevor! Planning and preparation is key in India, I think, but also going with the flow and remembering it’s not the Western world. We left some wiggle room so that we’d get to do what we wanted while still planning for hiccups. Communication with a nation and her people: with head-wiggling and lots of delicious vegetarian food. SOLD! Do we need more in life? So exciting to start reading about your India travels! Lots of rich and helpful detail. Your blog was great help as I prepared, Lillie! I think India is an experience any traveler should have! As long as you’re aware of the risks and keep your head on, you’ll be fine. You can always opt for a group tour, too! I’ve always wondered what visiting India would be like and I’m just overwhelmed reading this post! Not sure I would be able to handle it traveling alone but it’s definitely a place I’d like to travel to eventually. We have some family friends planning to visit sometime later this year, I am going to have to quiz them on where they are going/how they are traveling. It is, but worth it! If they have questions, you can definitely give them my email! I have been dying to read about your trip!! Awesome. Delhi was our first taste of India, and not having many expectations meant that we were surprised at how much we liked it! I hope to return to India in the future, as well. Cat, your intrepid travel writer really shone in this entry! Although you are quick to balance the good with the bad, it’s clear that India certainly left its mark on you. Looking forward to more well-written posts–and interesting angles, such as this one on traveling observantly-about your experience! I needed this – thanks! Feel like I’ve been getting away from the heart of SandS! I’ve always been on the fence about India because of it’s extremes yet I feel in many ways it’s likely an easier place to travel in than Africa. Seems to have it’s tourism hubs and relatively decent transport but who knows, I’ll know the differences/similarities when I go. I’m glad you were adventurous and experienced as you did without the tour groups. You get a much better sense about a place! Sorry about the stomach bug. Hope that goes away soon! Nice long recap of your adventure there! Always so much more to learn about a place. Oh and paneer- is a fresh cheese. Very simple and easy to make too! Uyyy I can relate to that magical fat burner, I got one too while I was studying/working in Cuba. Luckily the health care system there treated me very well, but I’m still dealing with it months later. Éxito! Ashlee D. recently posted..My 3rd Blogoversary, question mark? Wow Cat. I’m not sure I could do this the way you two did. But I admire you so much for doing it! Great tips and insights. Love this. It may be my last great adventure for a while!! I’m glad we did it the way we did it, even with the hassles and delays. I think this perfectly sums up my experience in India “one can see everything and nothing”. India can be so overwhelming that it is easy to shut one’s self down and not focus on anything. I’ve been trying to find a way back for the last 18 years. As crazy as it can be, I think India gets into your being like no other place. It’s the truth, Mary! I can’t wait to go back. I loved reading this post about your experiences in India! I appreciate your honesty, and I’m glad you didn’t sugarcoat the details. I’ve always wanted to go to India, but reading this makes me think that I may need to hone my skills a bit before I go. Traveling through Europe is probably a piece of cake compared to tackling India! Traveling through Europe is a cakewalk – you’re right, Courtney! Trains usually run on time or someone speaks English, and there are seat belts and safe water and the like. India was an adventure (starting with our 40 hour trip to get there, haha!). A place every traveler should go! I love the bright colors and gorgeous photos. We still haven’t made it to India, but someday soon I hope! After all the places you guys have been, India will be no sweat and still blow your mind at how beautiful and crazy and lovable it is! Fantastic post Cat. India is somewhere I’ve always wanted to visit but have been wary of at the same time due to tales of crime and extremely poor hygiene, and when shone in this light I feel guilty for my preconceptions! You’ve captured it all magnificently. And that head wiggling stuff is hilarious. Best food ever? Yeah, I didn’t know I’d actually want to until we booked the tickets. It’s not the safest or cleanest place, but it gets into you somehow. Best food ever? IS THAT EVEN A QUESTION?! India is on my list of places I have to go. I really want time to explore the country a little and get a sense for it’s sights and sounds. The beginning of the post brought me back to my day’s living in Cairo, with the hussle bussle noise and daily distress of everything happening in such a madness filled world around you! I’d love to visit Cairo. It may even seem like a cakewalk after India! I’m intrigued by India; it’s such an exotic land with amazing cuisine and colorful culture. Yet I don’t know that I want to see it ‘in living color’. Istanbul is the farthest east I’ve been to date and it took me decades to make it that far…but who knows what the future holds. You survived a challenging adventure, Cat, and I’m greatly inspired!! Thank you, Gayla! Istanbul was still fairly European to me. I felt like I jumped right into the deep end in India! Wow — you crammed a lot into that trip. My biggest regret of the years I lived in Japan was that I never made it to India. One of these years. And yes, food will also be high on my list. We did do a lot, and it was exhausting! India seems a lot more accessible these days, and there appear to be many grew tour operators, if that’s how you’d prefer to travel. Do it – you may leave disappointed, but the itch will have been scratched! Indian here…It’s always interesting to read an outside perspective. The so called head wiggle is a South Indian thing, and it’s as confusing to the rest of us as it probably was to you. Biswapriya Purkayastha recently posted..Caliph Abu Bakr’s Lonely Heart Club Bang! 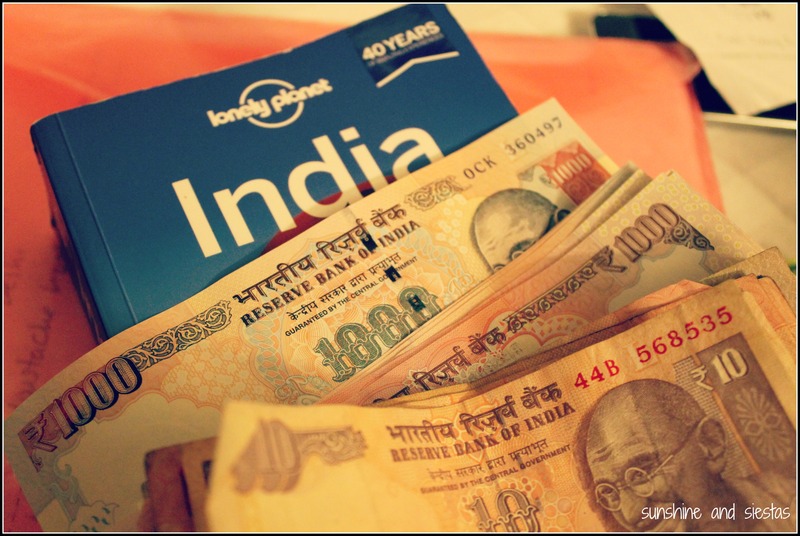 What I loved about my time in India was how different the four cities I traveled to were from one another! I’d love to take another trip and stay for several months.